Bonito, Brazil is a place that’s still not very known and that makes this place even more special. It’s a beautiful destination for nature lovers and definitely one of the highlights of my trip through Brazil. In this travel guide I tell you everything about Bonito: best places to eat, best things to do and see, and where to stay. Let’s go! What to do in Bonito, Brazil? The reason you come to Bonito? To snorkel! But not just normal snorkeling: in a river. I had never snorkeled in a river before, especially not in a river with anacondas and caimans, but it was so amazing. 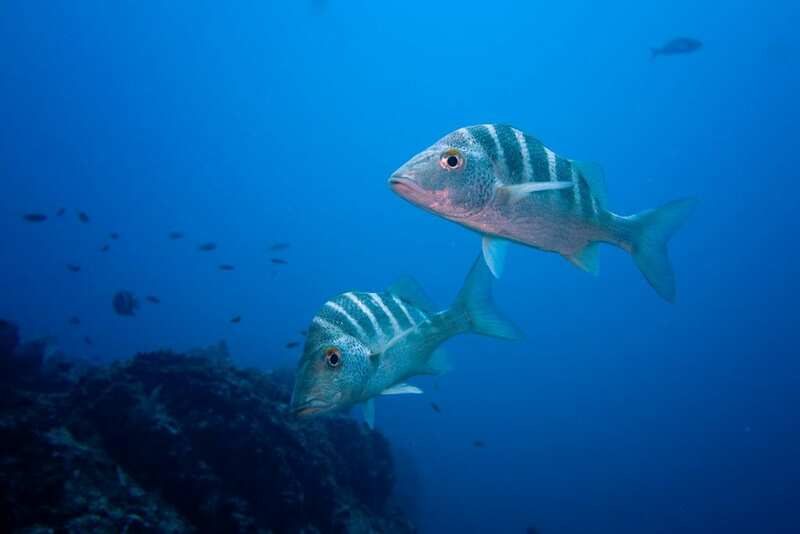 The best activity is snorkeling in the Prata river. This tour takes about three hours and you snorkel through beautiful scenery. A green forest is waiting for you. 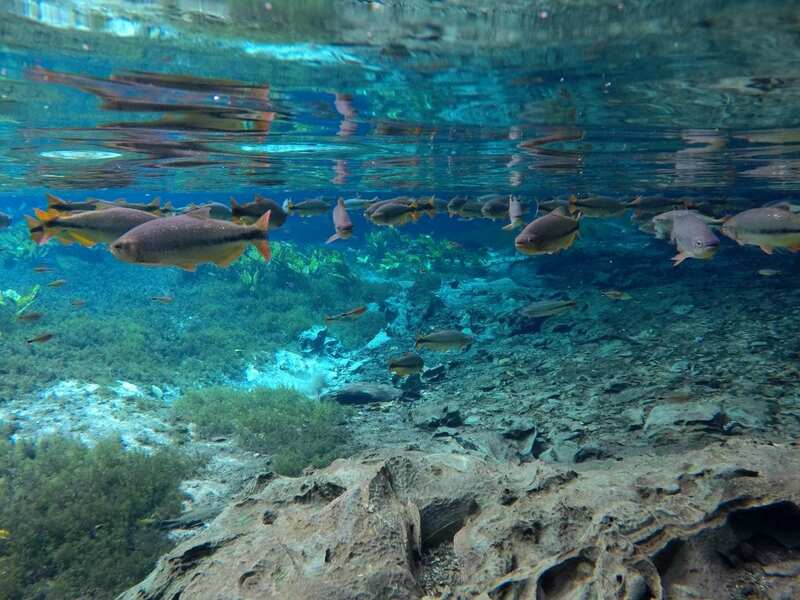 The water of the river is so clear, so you can see all the beautiful and big fishes, and even sand that seems to boil. How awesome! The ride is gorgeous and surreal, and it’s an unique way to cross the jungle. The stream is pretty strong so you basically don’t have to do anything. Just enjoy and relax! Another great option is to snorkel in a cave nearby. No one knows how deep this cave really is, but the record an experienced diver has set is two hundred meters. And that wasn’t the end for sure. The water is very clear so it’s amazing to look right into the hole. Especially when the sun shines, you can see all the rays into the water. How magical? Are you in for some relaxing? Close to Bonito you find some great lakes, where you can swim and just hang out. Combine this with all the caves nearby and you’ll have an awesome day. Where to sleep in Bonito? I’ve stayed in São Jorge Pousada (not the hostel but the hotel) and I can recommend this hotel. Although it’s pretty simple and not special, the location is the best. 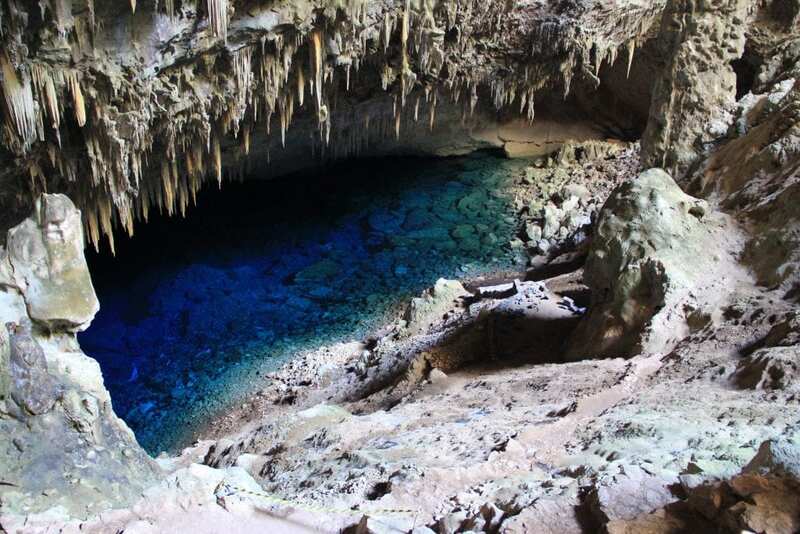 It’s located right in the centre of Bonito so everything is on walking distance (except the river, lakes and caves). The wifi is working fast, the showers are hot and the breakfast is included. You can also go to the gym for free (like a real gym, not a hotel gym) and get a free caipirinha in the hostel. What’s not to love? Where to eat in Bonito? Go to the Juanita restaurant for some great good, with delicious fresh fish and a lot of dishes on the side. It’s a very popular restaurant so every evening a lot of people come here to eat, what makes this place very cozy. Don’t want to spend a lot of money? Just share a meal with the two of you. Another nice restaurant is Casa do João, with live music every night. You can sit inside or outside and its a combination of a bar and restaurant. You do have to pay a bit for the music, so make sure you stay here for a little while to enjoy the music and vibes. Do you want to get snacks or lunch? Just get some delicious acai, which is typical Brazilian. It’s ice that is made out of a fruit and you can get acai everywhere. Mix it with granola, nuts, banana, kiwi, strawberry and more. I love it! How to get to Bonito? The best way to go to Bonito is from Campo Grande or Pantanal. When you book a tour in Pantanal of several days, transport to or from Bonito is included (well, most of the time). The journey takes about four or five hours from Pantanal. It’s the same if you come from Campo Grande, but then you have to take the bus. In the terminal of Campo Grande you buy a ticket to Bonito and the ride takes about five hours. From the bus station you can walk to the centre of Bonito within a few minutes. How long to stay in Bonito? Snorkeling in the Prata river is the activity you come for and the rest is just extra. I recommend staying two nights in Bonito, so you can snorkel in the mysterious cave and in the river. In my opinion this is enough, the town itself is not that special. Want to read more about Brazil? Check out all my travel guides and practical information in my Brazil articles.